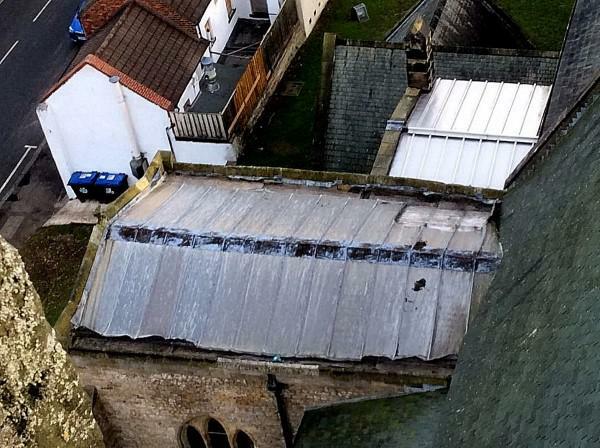 Lead thieves have struck again at St Edmund’s ancient parish church in Sedgefield. Churchwarden Brian Mutch said today that the raiders had caused “a considerable amount of damage”. It is not known exactly when the theft took place. It was discovered at the weekend when Mr Mutch climbed to the roof of the tower to check a problem with the flagpole. He then spotted that a large piece of lead sheet had been torn from the south east corner of the South Transept, an eight metre long strip of lead along the ridge of the transept was missing, and that all the lead to the box gutters and flashing on both sides of the transept had been torn out. “It is appalling that anyone should cause damage of this magnitude to such a beautiful building”, said Mr Mutch. A specialist roofing company has been brought in to identify the full extent of the damage so that temporary repairs can be carried out. Police are also investigating. The latest theft comes eight years after another major raid on St Edmund’s when thieves stripped lead from the roof of the south transept and above the organ loft which cost £24000 to replace. Earlier this year, lead was stolen from the ‘hips’ on the lych gate at the church and damage was caused to the roof tiles. The repair bill is expected to be in the region of £2000. Services at St Edmund’s, says Mr Mutch, will not be affected by the theft.